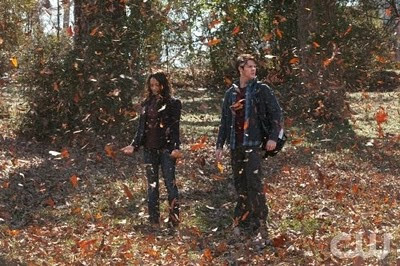 Blood Lines: The Vampire Diaries S2 E17 "Know Thy Enemy"
The Vampire Diaries are finally back and they did not disappoint! We've got secrets, betrayals, revelations, torment, serious power, and a little something for the ladies and the gents. I dare you to find something to complain about. "Know Thy Enemy" (great title for this episode) starts off where "The House Guest" left off--with Isobel at the door. She claims it's important that she come inside to talk to Elena but Elena shuts the door on her. Then Elena gets the fun of dealing with an angry Aunt Jenna, who feels lied to and betrayed by everybody. Jenna really needs to try remembering that she's an adult. Getting teary, storming out, and locking yourself in your room--not an appropriate way of dealing with the situation. The Gilberts must have been really hard up for guardians when they were making out their wills. When Alaric hears what's happened and rushes over, Jenna coldly informs him and Elena that she's going to stay on campus for a while because she just can't stand being in that house. At least we get the satisfaction of watching Alaric give John a bloody nose after John gets even more smug than usual over the situation with Jenna. Meanwhile, once Katherine hears that Isobel is in town she asks Stefan and Damon not to let Isobel and John know that she's still around. She claims that they might not be too happy with her for staying in town after getting out of the tomb. She also claims that she and Stefan and Damon are on the same team (the one that wants Klaus dead) and that she can prove useful as a body double for Elena. They don't exactly look convinced but they don't argue with her, either. By the way, guys--the tank top Katherine's wearing in this scene is definitely for you. Who woulda thunk Nina Dobrev had it in her to be such a hottie? While this is going on Caroline's got her own problems: Matt got away from her after she told him she was a vampire and now she can't find him. She also doesn't know what he might say to anyone else. At least the vervain he'd been taking should be out of his system soon so that when Caroline does find him she can compel him into behaving. Back at Elena's, as she's discussing the Isobel situation with Stefan, John comes to the door and asks them to come downstairs for a minute. It's no real surprise when we see that he's invited Isobel in. She claims that she's been looking for Klaus, although she couldn't find him, and that rumours of a doppelganger are rampant. She believes any vampire who wants in with Klaus would love a chance to deliver the doppelganger to him, so vampires are about to descend on Mystic Falls and kidnap Elena at any moment. She tells Elena she's got a safe house for her with the deed in Elena's name so that no vampire--including herself--can enter without Elena's permission. Elena doesn't buy any of it and snaps at Isobel to get the hell out of her house. Damon, Jeremy and Bonnie are busy checking out Luka's apartment (confirming that he really is dead). They help themselves to all the grimoires that Luka and his dad had collected and Bonnie also finds the spell she needs to harness, as Damon puts it, "ancient dead witch power." Then they head to the burial ground/massacre location, which Damon has known about all along since he tried to save Emily Bennett from being burned there (not that ghost Emily appreciates it). Strangely enough the location is inside a house (why would you burn anything--or anyone--inside a building?) Inside, Damon becomes trapped by the window, unable to move. Then his sun-protection ring stops working. Luckily Bonnie counteracts the dead witches' magic with her own but Damon decides he'd be better off waiting outside. Wise decision. Now here's where the real fun begins. Isobel returns to the foreclosed-on house she's staying in. Suddenly Katherine is there. They attack each other but then start smiling. It turns out Isobel and Katherine are good friends and Isobel is really in town to save Katherine, not Elena. Yes, Isobel has made a deal with Klaus (through one of his witches) that he'll forgive Katherine if she brings him the moonstone and the doppelganger. Meanwhile, believing that she's been trying all along to save their daughter, John has been unwittingly playing informant by telling Isobel everything that's been going on. Katherine and Isobel are pretty damn pleased with their current circumstances. Later at the Salvatores', Damon, Stefan and Elena are trying to figure out their options when Katherine shows up, a little too interested in how they're planning on saving the day. But since they all despise Katherine no one gives anything away. It's a relief that the bad guys don't know quite everything. Yet. Even though they don't trust Katherine they still leave her alone in the house while they busy themselves elsewhere. Katherine takes the opportunity to search Damon's room, pocketing a large wad of cash and lucking out when she notices the moonstone in a bowl filled with bars of soap (it does blend nicely, but I still can't believe Damon "hid" it there). So now all Katherine needs is the doppelganger and she's home free. While Katherine's been taking care of things on her end, Isobel stops Alaric on the street. She gives him a heartfelt apology and tells him she really, truly did love him once upon a time. Then she lets Klaus's witch have him and Alaric collapses to the ground, overcome by magic. Isobel's next stop is the Lockwood mansion, where Elena is accepting a cheque for her mom's charity (Jenna was supposed to do it but she's too busy sulking). When John sees Isobel he asks what she's doing there. Turns out she's creating a distraction. She bites him and a moment later John's body comes hurtling down the stairs, interrupting Elena's speech. Okay, I do have one complaint about this episode (damn). Why, when he knows Elena is in constant danger, does Stefan rush to John leaving Elena unprotected in the other room? Of course everyone else follows right behind, giving Katherine--dressed identically to Elena--enough time to forcibly switch places with her. Damon would never have been so stupid. Just saying. Stefan returns to "Elena" and they leave. At least he's not dumb enough to believe that Katherine is Elena. He confronts her when they reach the car, but Katherine is ready for him. She injects him with something so that he passes out and can't follow her. Things are not looking good for our heroes. At some point Stefan regains consciousness and calls Damon who--and this one is for the ladies--is in the process of changing shirts. He's infuriated that Katherine has betrayed them and taken the moonstone. The one positive is that Bonnie has luck with the spell. It involves her screaming and weeping in agony but she does end up channelling the power of all the dead witches. Now it's hers to use as she pleases (she starts by showing Jeremy her impression of Storm from The X-Men). Of course, there is the small matter of the witches giving a warning about not using too much of the power at one time but Bonnie's not too concerned about it. Matt finally makes an appearance, looking dishevelled and slightly deranged. He accuses Sheriff Liz of covering up the real cause of Vicky's death (which she of course did, but she's not about to admit it, now is she?) She takes him back to her place to calm down. Caroline is relieved to find Matt at her house (Liz left him there when she got a call). He shrinks from Caroline and feels betrayed by her and all his friends, but he says he didn't tell anyone about Caroline being a vampire or anything else she told him. His anger and hurt, however, are overwhelming so he asks Caroline to compel him. He doesn't want to have to look at her and feel this way about her. She doesn't want to make him forget but he gets so agitated she finally gives in. Back to the bad guys and their nefarious plans, Isobel has Elena and is driving with her when she gets a call from Katherine. Katherine tells Isobel about her success with the moonstone and mentions that they'd better skip town fast. But wait! It turns out Isobel is double-crossing Katherine. She tells Katherine that she had to do what she was told and that what Klaus really wanted was the moonstone and Katherine. Before Katherine can fully register what's happened, uber-witch is on her. Isobel then takes Elena to her own grave. She tells Elena how her parents still come to visit every week even though there's no body buried there. She also talks about the woman who should be in the grave, the one who gave birth to Elena and desperately wished she could see her grow up. If this is part of some diabolical plan it's a strange one. Suddenly she gets a call from Klaus's witch telling her that he has Katherine and the moonstone and that Klaus wants her to let Elena go (he's done with her for now). With that Isobel is free of Klaus's compulsion. She apologizes to Elena for being such a disappointing mother. Then she rips off her protective pendant and burns to death in the sun as Elena watches, horrified. Safely back at Stefan and Damon's (not sure how Elena got there) they discuss why Klaus let her go and what their next move is. They decide to offer Elena some greater protection by signing over the deed to their house to her. Why do I get the feeling they'll come to regret that? Until then they're rather pleased that no one knows about Bonnie's newfound powers except them, which makes Bonnie their secret weapon. But a weapon, secret or not, is only good if you know where to aim it--and so far Klaus remains an invisible enigma. Elena ends up having a serious talk with John, in which he explains why he trusted Isobel and swears he'll do whatever Elena wants him to do. She decides to give him a chance seeing as how he is the only parent she's got left. Maybe she can learn not to hate him. It's heartwarming, really. Less heartwarming is Jeremy's discovery. He somehow manages to translate the dead witches' warning and realizes that it is significantly more serious than Bonnie let on. If she uses too much of the power it will kill her. Bonnie admits she'll need all the power to defeat Klaus but she's more than willing to sacrifice herself in order to save everyone else. What is with the girls in Mystic Falls? Is martyrdom in this year, or what? The surprises keep coming. Matt and Liz sit in her squad car, talking. It seems he did tell her everything that happened with Caroline and Liz responded by giving him vervain and hatching a plan where he would ask Caroline to compel him. So everything that happened earlier was merely an act. Once Caroline thought he was compelled he returned to Liz and told her all the latest details Caroline had let slip. Then the two of them mourn Caroline since she's dead. This does not bode well (although you'd think they could see past the vampire to the person). The biggest shock of all comes when Katherine wakes up in a strange room with the witch as he performs a spell over Alaric, who is unconscious. There are strange heart-shaped glass containers around Alaric, which are filled with blood, and transfusion tubing leading from them to him. Suddenly Alaric wakes up and stands. Hey, kids--guess why no one knows what Klaus looks like. Because he jumps bodies via blood and magic. No idea where Alaric's gone but Klaus has taken up residence inside his body. This is a creative and unexpected twist. And Katherine is terrified as soon as she realizes. Who can blame her? I just hope we get Alaric back eventually. Appearance: Human until the vampire emerges, then dark/red eyes, dark facial veins (especially around the eyes), and prominent fangs. Strengths: Ability to compel humans (Originals can also compel other vampires). Some vampires have magic rings or pendants that allow them to walk in the sun unharmed. Super strength, speed. Weaknesses: Vervain, sunlight, witchcraft. Compulsion by an Original. Mythology: A vampire needs an invitation from a resident human to enter a house. They don't need invites to enter vacant houses, houses occupied only by vampires, or houses whose owners have died. Isobel: Hello, Elena. It's nice to see you again. Katherine: I did what I had to, to get out of the tomb. Now I'm reconsidering my alliance. Stefan: What do you know? Katherine: I know I want Klaus dead, which puts me squarely on Team You. Damon: [entering Luka's apartment] Yep. Everybody's dead. Katherine: I've been honest with you. Time to return the favour. Damon: I'm going to be honest with you--don't mistake the fact that we haven't set you on fire in your sleep for trust. The Vampire Diaries, Season 2 Episode 17 "Know Thy Enemy." Written by Mike Daniels. Directed by Wendey Stanzler. From The CW.